Our website policies are designed with you, the customer, in mind to ensure that your online shopping experience with Briscoes will be secure, prompt, efficient and hassle-free. As far as possible our online policies are consistent with our in-store company policies and procedures. The delivery charge is $5, with a few exceptions*. All Briscoe Group freight being delivered by Fastway Couriers should be attempted to be personally delivered to the recipient with a signature obtained in accordance with the Fastway Couriers standard policy. To return products please either visit your nearest store with a copy of your invoice, or call us on 0800 274 726 and we will advise you on how best to return the goods to us. The prices for the products listed on this site are in New Zealand dollars and include GST, but not any delivery charges. We endeavour to ensure that all prices listed on this site are consistent with the prices offered at our stores. Briscoes reserves the right to amend or rectify any errors in pricing or product specification within 24 hours of being notified of it or after an order has been processed. Briscoe Gift Vouchers are available to purchase in all our stores as well as online. To purchase a Gift Voucher on our website, choose the Gift Voucher amount that you wish to purchase then add it to your Shopping Bag. At this stage Briscoe Gift Vouchers can only be redeemed in store. Briscoes Gift Vouchers are not redeemable for cash. 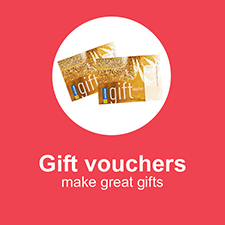 Click here to view Briscoe Gift Vouchers. Colour options indicated are as close as the 4 colour printing process allow. Accessories not included. Colours & sizes may vary between stores. Limited stock available on all specials. Personal shoppers only, no trade supplied. If you find a lower adverstised or ticket price in any other retail outlet on an identical item (i.e. brand, colour, size) which is currently in stock, upon confirmation we’ll beat the price by 10% - on the spot. See in-store for details.